Staff Photo by John Rawlston Chattanooga State Community College instructor Doug Ledford teaches a surgical technology class on Wednesday morning at the school's new Health Science Building. Although construction continues at the building, some classes already are being held there. Brittany White began her two-year degree in dental hygiene at Chattanooga State crammed into small classroom spaces and using 30-year-old equipment. This fall, Ms. White and other students in nursing and allied health fields are being trained in a new 103,000-square-foot building with state-of-the-art equipment and labs. "I love it," said Ms. White, who was working in the dental clinic in the new facilities. "It is so amazing. ... Before we had really old stuff." The new Health Science Center at Chattanooga State Technical Community College was proposed in 1992, but construction didn't begin on the $33 million project until last April. The college was awarded state funding for the center in 2005, and officials raised more than $3 million in private money for scholarships and equipment. The facilities will allow Chattanooga State to expand enrollment in allied health programs. In previous years, the college has had to turn away qualified students because of space constraints. The two-story Health Science Center, which has 60,000 square feet of classroom space and three auditoriums, already is holding classes. However, construction workers continue to put the finishing touches on some classrooms and the building's entrance, said Chattanooga State President Jim Catanzaro. Dr. Catanzaro said all work on the building should be competed by Oct. 27, when school administrators plan to unveil the building to Gov. Phil Bredesen and Tennessee Board of Regents officials. "We are pumped," said Dr. Catanzaro. "When it is finished, it's going to be a showplace." The Health Science Center will house programs in nursing, health information management, dental assistantship, dental hygiene, physical therapy, respiratory therapy and surgical technology. College officials expect the health science center to help head off a crisis in local health care training. In 2008, Chattanooga State admitted only 157 nursing students out of 741 applicants, and more than 500 of those applicants were qualified for the program, officials said. This year, new facilities allow the school to train more than 300 students for nursing degrees, Dr. Catanzaro said. Howard Yarbrough, dean of nursing and allied health at Chattanooga State, said all programs are expected to grow about 25 percent in the coming years. "The building was built for growth," Dr. Yarbrough said. "The expectation is that we will increase enrollment." * The four-year university-based bachelor's of science in nursing degree provides the nursing theory, sciences, humanities and behavioral science preparation necessary for the full scope of professional nursing responsibilities. Upon graduation, an individual must pass the NCLEX-RN exam to obtain a license to practice registered nursing and use the RN title. * A two-year program granting an associate's degree in nursing prepares individuals for a defined technical scope of practice. Set in the framework of general education, the clinical and classroom components prepare nurses for roles that require nursing theory and technical proficiency. Upon graduation, an individual must pass the NCLEX-RN exam to obtain a license to practice registered nursing and use the RN title. * A licensed practical nurse is not a registered nurse. 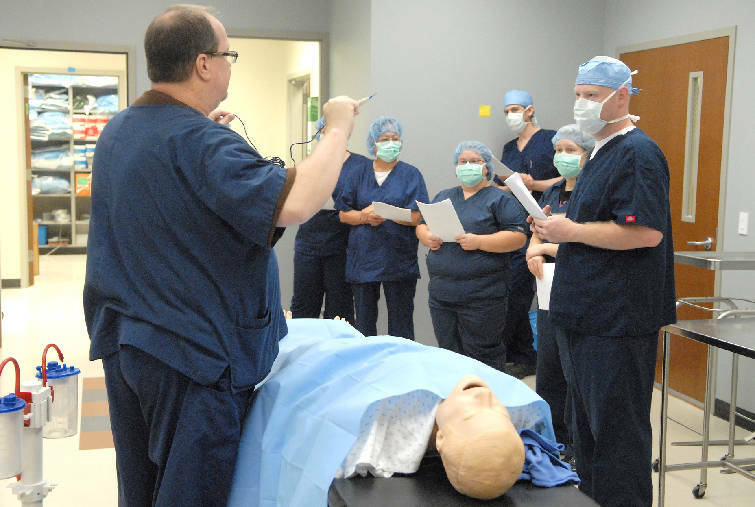 An LPN has taken a 12- to 14-month post-high school educational course that focuses on basic nursing care. LPNs must pass the NCLEX-PN exam to practice.